Watch the talk on Loom at Clojure/West 2014 and view slides. Also, there's a video of the talk at LispNYC and slides. Feel free to join Loom mailing list and ask any questions you may have. => "edge from node 5"
Nothing but Clojure. There is optional support for visualization via GrapViz. 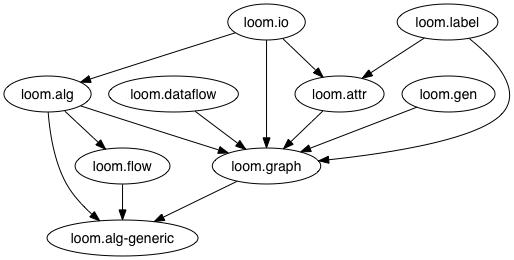 The dependency graph of Loom's namespaces, generated by lein-ns-dep-graph.